For other uses, see Quetta (disambiguation). Quetta (Pashto: کوټه‎ Kwaṭa; Balochi: کویته‎; Urdu: کوئٹہ‎; [kʷɛʈə] pronunciation (help·info); formerly known as Shalkot (Pashto: شالکوټ‎)) is the provincial capital and largest city of Balochistan, Pakistan. Quetta was largely destroyed in the 1935 Quetta earthquake, but was rebuilt and now has a population of 1,001,205 as of 2017, while the Quetta District has a population of 2,275,699. Quetta is at an average elevation of 1,680 metres (5,510 feet) above sea level, making it Pakistan's only high-altitude major city. The city is known as the "Fruit Garden of Pakistan," due to the numerous fruit orchards in and around it, and the large variety of fruits and dried fruit products produced there. Located in northern Balochistan near the Pakistan-Afghanistan border, Quetta is a trade and communication centre between the two countries. The city is near the Bolan Pass route which was once one of the major gateways from Central Asia to South Asia. Quetta played an important role militarily for the Pakistani Armed Forces in the intermittent Afghanistan conflict. Quetta, which is a variation of Kōṭ, is a Pashto word meaning "fortress". The immediate area has long been one of pastures and mountains, with varied plants and animals relative to the dry plains to the west. The first record of Quetta is from 11th century CE, when it was captured by Sultan Mahmud Ghaznavi during his invasion of South Asia. In 1543, Mughal emperor Humayun came to Quetta en route to Safavid Persia, leaving his son and future Mughal emperor Akbar here. In 1709, the region was a part of Afghan Hotak dynasty and stayed a part until 1747 when Ahmed Shah Durrani conquered it and made it a part of Durrani Empire. First European visited Quetta in 1828, describing it as mud-walled fort surrounded by three hundred mud houses. In 1876 Quetta was occupied by the British and subsequently incorporated into British India. British General John Jacob in 1856 had urged his government to occupy Quetta given its strategic position on the western frontier. British Troops constructed the infrastructure for their establishment as it was a strategic location. By the time of the earthquake on 31 May 1935, Quetta had developed into a bustling city with a number of multistory buildings and was known as "Little London" because of that. The epicenter of the earthquake was close to the city and destroyed most of the city's infrastructure, killing an estimated 40,000 people. Quetta has a semi-arid climate (Köppen BSk) with a significant variation between summer and winter temperatures. Summer starts about late May and goes on until early September with average temperatures ranging from 24–26 °C (75–79 °F). The highest temperature in Quetta is 42 °C (108 °F) which was recorded on 10 July 1998. Autumn starts in late September and continues until mid-November with average temperatures in the 12–18 °C (54–64 °F) range. Winter starts in late November and ends in late March, with average temperatures near 4–5 °C (39–41 °F). The lowest temperature in Quetta is −18.3 °C (−0.9 °F) which was recorded on 8 January 1970. Spring starts in early April and ends in late May, with average temperatures close to 15 °C (59 °F). Unlike more easterly parts of Pakistan, Quetta does not have a monsoon season of heavy rainfall. Highest rainfall during 24 hours in Quetta is 113 millimetres (4.4 in) which was recorded on 17 December 2000, Highest monthly rainfall is 232.4 millimetres (9.15 in) which was recorded in March 1982, also the year of the highest annual rainfall, at 949.8 millimetres (37.39 in). In the winter, snowfall has become quite erratic (December, January and February). The city saw a severe drought from 1999 to 2001, during which the city did not receive snowfall and below normal rains. In 2003 the city received snowfall after a hiatus of five years. In 2004, and 2005 the city received normal rains after three years without snowfall while in 2006, 2007 and 2009 the city received no snow except in 2008 when Quetta received a snowfall of 10 centimetres (4 in) in four hours on 29 January, followed on 2 February by 25.4 centimetres (10 in) in 10 hours – the city's heaviest snowfall in a decade. During the winter of 2010 it received no snow and saw below normal rains due to the presence of El-Nino over Pakistan. The population of the city is around one million. In 2016, it was estimated at 1,140,000, but the 2017 Census revealed a total of 1,001,205. This makes it the largest city in Balochistan province and one of the major cities of Pakistan. The scholars disagree about the demographics of the city. According to some, the city has a Pashtun plurality followed by Baloch people, other indigenous people of Balochistan, and lastly the settlers from other areas of Pakistan. Others think the city has a Pashtun majority followed by Balochs, Brahuis, Hazaras, Punjabis and Muhajir people. Urdu being national language is used and understood by all the residents and serves as a lingua franca. According to Reuters and the BBC, there are as many as 500,000-600,000 Shia Hazaras living in Quetta and its surrounding areas. At the local government level, the city is governed by a municipal corporation consisting of 66 ward members which elects a mayor and a deputy mayor. 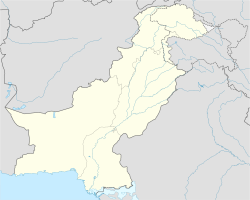 Quetta is on the western side of Pakistan and is connected to the rest of the country by a network of roads, railways and its international airport close to its center. At an altitude of 1,605 metres (5,266 feet) above sea level, Quetta Airport is the second highest airport in Pakistan. Pakistan International Airlines has regular flights to and from the other major cities of Pakistan including Islamabad, Gwadar, Karachi, Lahore and Peshawar. Quetta Railway Station is one of the highest railway stations in Pakistan at 1,676 metres (5,499 feet) above sea level. The railway track was laid in the 1890s during the British era to link Quetta with rest of the country. The extensive network of Pakistan Railways connects Quetta to Karachi in the south, by a 863 km (536 mi) track, Lahore in the northeast (1,170 km or 727 miles) and Peshawar further northeast (1,587 km or 986 miles). A metalled road runs alongside the railway that connects Quetta to Karachi via the nearby town of Sibi to Jacobabad and Rohri in the plain of the River Indus. Hanna Lake, which nestles in the hills ten kilometres (six miles) east of the city, is a turquoise body of water that contrasts markedly with the bare surrounding hills. It is an attractive destination for vacationers, with facilities for boat hire. A lakeside restaurant is crowded with hikers and campers during holiday periods. At one end there is an irrigation dam, while on the eastern shore there is Hayat Durrani Water Sports Academy, the only water sports training center in Balochistan. The Hanna Lake Development Authority, the Hayat Durrani Water Sports Academy and Merck Marker have planted a range of trees in the Hanna Lake Mountains both for beautification and the protection of the environment. Cricket and football are the two most popular sports among the people of Quetta. However, a number of other sports are also played. This includes hockey, taekwondo, boxing, squash, mountaineering, and bodybuilding. Football teams from Quetta include Quetta Zorawar, Muslim FC, Hazara Green Football, Baluch Football and Quetta Bazigars Club. The Shaheed Nauoroz Stadium is the largest stadium in the city. The city also has Ayub National Stadium, a multipurpose stadium used for football and cricket and Bugti Stadium used only for cricket. The Quetta Bears are a domestic cricket team represented the city in the List A and Twenty 20 tournaments. The Quetta Gladiators is a Pakistani professional Twenty20 cricket team based in Quetta. It competes in the Pakistan Super League (PSL). In hockey, Quetta has produced Zeeshan Ashraf and Shakeel Abbasi, who were members of the Pakistan national hockey team. Local facilities were created in the city for mountain climbing and caving as well as water sports. Hayatullah Khan Durrani (Pride of Performance) is the chief executive of Hayat Durrani Water Sports Academy the Balochistan's first and only Rowing, Canoeing, Kayaking, Sailing, rough swimming and boating academy where all such facilities provides free to the yout members at Hanna Lake.Pakistan Super League players’ draft tomorrow In kayaking, Muhammad Abubakar Durrani, National Junior Champion was selected for the world Junior Canoeing Championship in 2009 in Moscow. ^ a b "Government Organization – Government of Balochistan". balochistan.gov.pk. Retrieved 6 September 2016. ^ "PkMAP candidate nominated for Quetta mayor". 27 January 2015. ^ a b c DISTRICT WISE CENSUS RESULTS CENSUS 2017 (PDF) (Report). Pakistan Bureau of Statistics. 2017. p. 13. Archived from the original (PDF) on 2017-08-29. Retrieved 29 March 2018. ^ Thornton, TH. "Colonel Sir Robert Sandeman: His Life and Work on Our Indian Frontier. A Memoir, with Selections from His Correspondence and Official Writings". Pg. 211. University of California. J. Murray, 1895. ^ "POPULATION SIZE AND GROWTH OF MAJOR CITIES" (PDF). ^ "DISTRICT WISE CENSUS RESULTS CENSUS 2017" (PDF). pbscensus.gov.pk. Archived from the original (PDF) on 29 August 2017. ^ "Mongabay -environmental science and conservation news". Archived from the original on 4 March 2016. ^ "The Fruit Garden of Pakistan – Quetta". asadasif.com. 4 February 2008. Retrieved 10 January 2017. ^ ""History of Quetta" Government of Quetta". quetta.gov.pk. Archived from the original on 9 March 2011. Retrieved 26 June 2016. ^ a b Burki, Shahid Javed (2015). Historical Dictionary of Pakistan. Rowman & Littlefield. ISBN 9781442241480. ^ BHC. "History of District". bhc.gov.pk. Retrieved 26 November 2017. ^ Dodwell, H. H. (1929). The Cambridge History of the British Empire. CUP Archive. ^ ڈان اردو (30 December 2013). "پاکستانی شہروں کی تاریخ". dawnnews.tv. Retrieved 26 February 2016. ^ "Leading News Resource of Pakistan". Daily Times. 4 February 2008. Retrieved 8 May 2012. ^ Cite error: The named reference https://www.ospk.info was invoked but never defined (see the help page). ^ "Climatological Normals of Quetta". Hong Kong Observatory. Retrieved 2014-01-27. ^ "Extremes of Quetta". Pakistan Meteorological Department. Retrieved February 3, 2015. ^ Elahi, Asad (2006). "2: Population" (PDF). Pakistan Statistical Pocket Book 2006 (HTML). Islamabad, Pakistan: Government of Pakistan: Statistics Division. p. 28. Retrieved 29 March 2018. ^ Jonah Blank, Christopher Clary & Brian Nichiporuk 2014. ^ Sarina Singh (2008). Pakistan & the Karakoram Highway. Lonely Planet. p. 142. ISBN 978-1-74104-542-0. ^ "The Crowded-Out Conflict by Ann Wilkens – Pashtun form the Majority". ^ Abubakar Siddique (2014). The Pashtun Question: The Unresolved Key to the Future of Pakistan and Afghanistan. Hurst. p. 22. ISBN 978-1-84904-292-5. ^ "Two killed in sectarian attack in southwestern Pakistan". Reuters. 22 April 2018. ^ Kermani, Secunder (12 December 2017). "The community caged in its own city". BBC News. ^ "Canoeing championship at Hanna Lake". Dawn News Daily. 29 March 2014. ^ Pakistan Times|http://news.pakistantimes.com/2014/08/15/abubakar-durrani-wins-independence-day-canoeing-championship-2014-320236[permanent dead link]. ^ "GEO TV Report Pakistan Players for Moscow >". Geo.tv. 28 July 2009. Archived from the original on 13 June 2010. Retrieved 21 January 2014.